Everyone loves the idea of making an extra coin, and that explains why many are welcoming the idea of a home based business opportunity. While one has the freedom of choosing to work on a full-time or part-time basis, home based opportunities are not that easy and straight forward for starters. You are likely to struggle when you start you home based opportunity and you will find yourself out of business and abandon that great idea that you had all along thought of. Just like any other trade or business, you need the right skills for the trade. For instance, someone who is new in the trade might not be having the much needed email marketing skills and might fail to know where to find the right customers. We have been in the business for long and seen many entrepreneurs fail to reach the level they could have easily attained because they lacked the right guidance and motivation. That is why we introduced resellersitehub.com to guide you to achieve your goals when you need to succeed with your home based business opportunity. Resellersitehub helps home based business succeed by introducing professional digital marketing tools such as white white label email marketing. Most people assume white label email marketing is technical and complicated. Let us bust the myth today! A reseller identifies a brand and picks any colors or imagery that represents the original company. The reseller then applies an email to the service platform that can reach the company’s clients. Technical support and operational guidance is part of the package. It ensures everything is running all the time smoothly. White label email marketing is seamless and earns your money without working too hard. Create an email campaign, send it to the clients and track the progress. In the process, you easily monitor the clients’ accounts. You can monitor their reports, usage, and campaign schedule. Why do we still use and love Google despite the emergence of other search engines? With white label email marketing, you create customer dependence. The clients will continue working with you once they get comfortable with your email, marketing software for their campaigns. Using integrated email marketing offers a highly targeted solution to your clients making the experience difficult to replace. Since you own the application that the clients use, it becomes easy to monitor their marketing analytics. Marketing analytics helps the reseller to maintain control over the clients marketing campaigns. As a reseller, your clients will see you as an email marketing expert. Naturally, your clients’ will trust you to execute their marketing campaign. When they need to launch a new email marketing strategy, they will come to you and not third-party vendors. Most resellers undermine the need for a proper support and customer care system. Your platform should be easy to use and have a reliable support team at hand. It builds your credibility as a trusted partner. 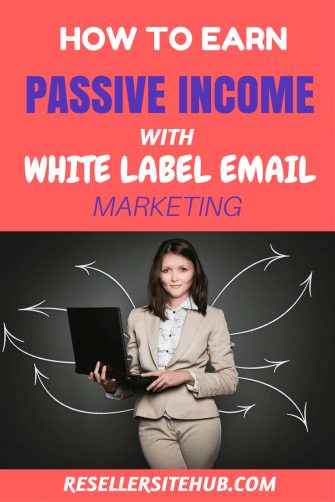 If you are looking for a home based business idea that will earn you passive income, you should try white label email marketing. How can you make money from white label email marketing? It is straightforward and there are various ways of earning that extra passive income. Think of it as a phone plan. Charge your clients a certain amount every month and an overhead charge if they exceed a certain limit. As a reseller, you are tasked with billing and collecting a certain percentage. Bill them anytime you make a sale. Alternatively, pay a low price and offer services at a markup. However, it requires you to play your cards right. Create a custom web banner on your website page as a reseller. It redirects visitors to a signup page. The idea works wells on sites with a high amount of traffic. Also, it is important to ensure the banner is strategically displayed so that it attracts the subscribers. It is a potentially effective way of making money from white label email marketing. While setting up an account, choose the logo, colors, and name of the brand for easy identification. The account setup process is simple and the perfect way to identify passive subscribers. Do you want to be part of the white label email marketing reseller business opportunity? For starters, you do not need to be an email marketing expert. At resellersitehub.com, we got you covered. All our orders are done by professionals who understand the ropes of email marketing. We have additional benefits in our packages such as technical and operational guidance, free hosting and email hosting, and easy-to-navigate websites. We also have the best social media marketing plan that targets both existing and potential clients. Contact us today and learn from the best!